Bauer, Kathleen D.; Liou, Doreen; Sokolik, Carol A. 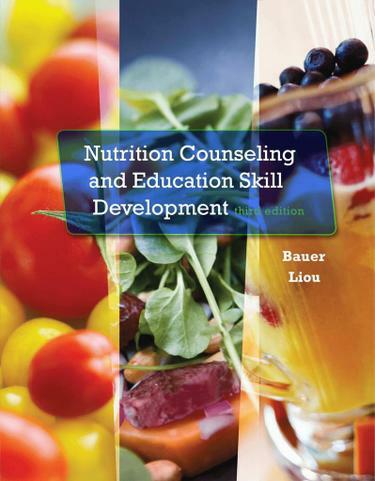 NUTRITION COUNSELING AND EDUCATION SKILL DEVELOPMENT, 3rd Edition, is a step-by-step guide to help entry-level practitioners through the basic components involved in changing food behavior and improving nutritional status. This book provides nutritional professionals with a solid foundation of counseling and education principles, opportunities to practice new skills, and knowledge of evaluation methodologies in an organized, accessible, and engaging approach. The authors' clear style helps readers translate theoretical perspectives on nutrition counseling into actual effective dialogues between client and counselor to influence client knowledge, skills, and attitudes. In addition, since the goals and objectives of nutrition counselors and educators complement each other, the scope of this text has expanded to include elements unique to nutrition education.